Nothing comes close to the sweetness of sleep. 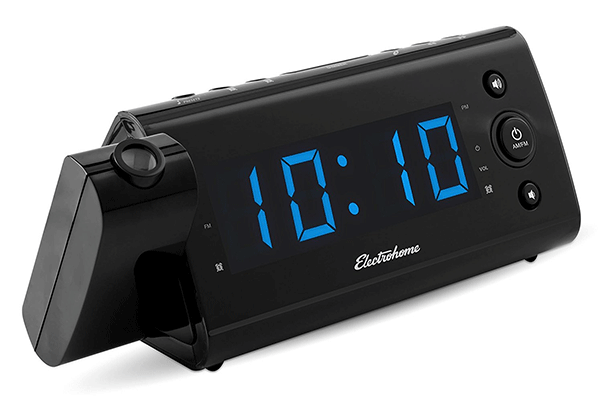 If you’re like a billion of other people around the world who have a hard time waking up in the morning, you need to consider buying a radio alarm clock. It wouldn’t be surprising to find out that your grandparents and great-grandparents used these devices to get up in the morning for work before the invention of smartphones. The main benefit of having a radio alarm clock is that it will ensure you’re not fired from work for oversleeping. 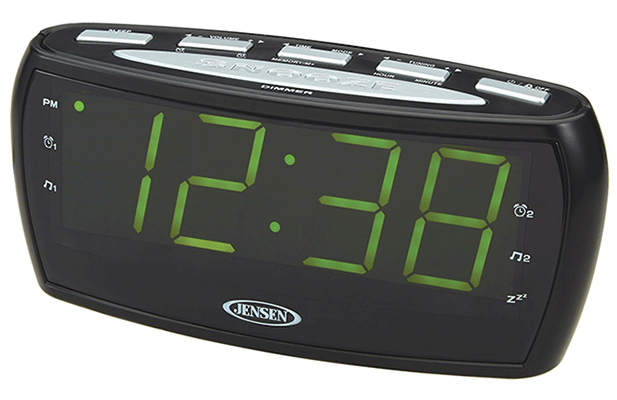 If you want large, bright numbers, the Jensen JCR-208A is the radio clock for you. It has a 1.8 inch LED display that lays out information such as time, radio station and lets you set your alarm time with ease. You don’t need glasses to read the screen, and you can also adjust the screen brightness. 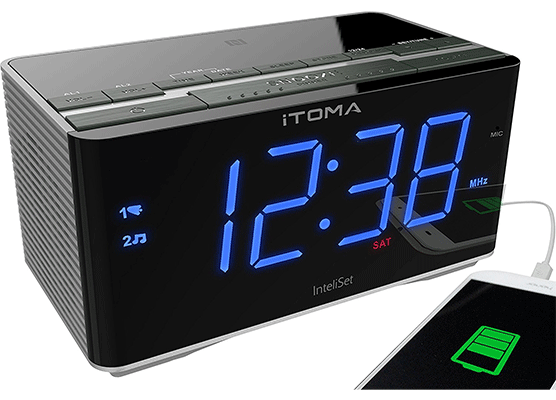 The iTOMA comes with everything you could think of to put in a radio alarm clock. Immediately you plug it in, the screen comes alive and automatically sets the date and time for you. You don’t have to worry about losing your preset stations and date because it features a standard CR2032 battery backup in case of power outage. 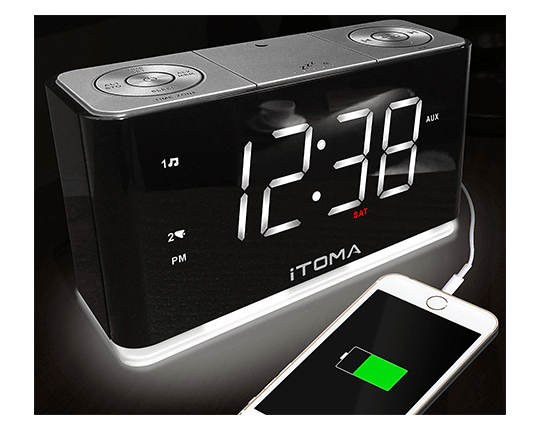 The clock also features different modes such as Bluetooth, auxiliary and USB connectivity to charge your electric devices. Digital radio tuning with 20 programmable preset stations. Perhaps the most outstanding quality about the Electrohome CR35W is its retro design that is reminiscent of the mid to late 90s era. 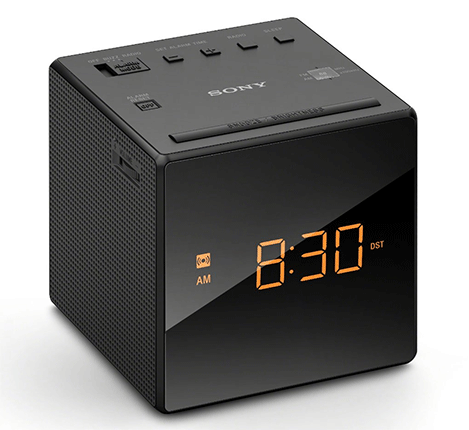 However, despite its throwback design, this radio clock does not lack when it comes to features. 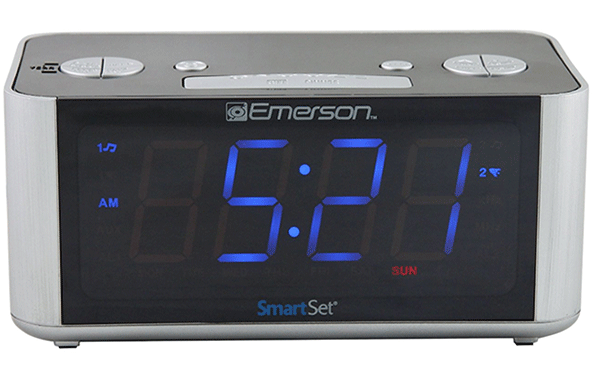 It has some of the most advanced features to be fitted in modern alarm clock radios as indicated below. The iTOMA is well made with a beautiful design. It also offers a great level of convenience with its large LED display that lets you read the time with great ease. The numbers are easy on the eyes, and the screen has an inbuilt light sensor that auto dims according to the brightness of the room. Large 1.4 inch White LED Display. Auto time setting with Daylight Saving Times (DST). USB Charging Port for your devices. 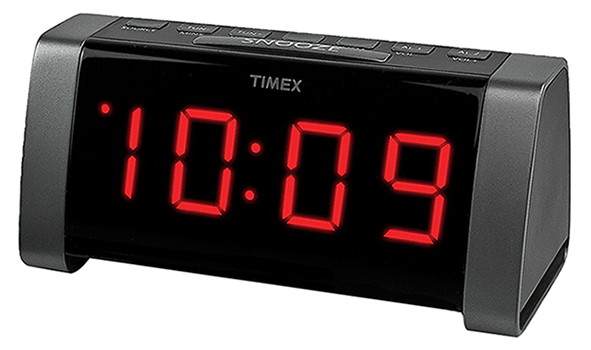 Overall, the Timex T235BY is a well-thought of radio clock that carries out its functions seamlessly. It has a sturdy build and is easy to operate. A nice feature is that the alarm starts low and gradually gets louder. What’s more, it has a large display screen that lights red which does not harm the eyes to look at when half awake. 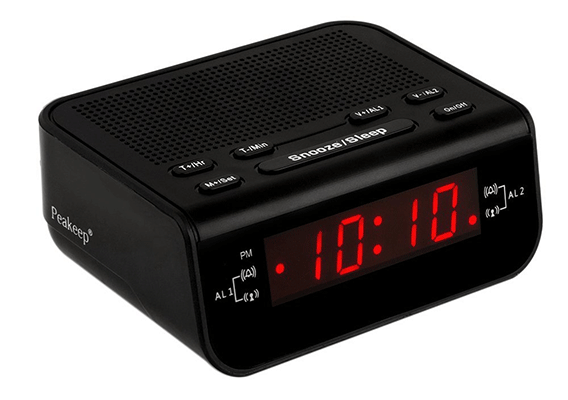 The Peakeep is for people looking for a small and handy alarm clock radio. Its small built and battery backup means you can carry it and listen to it while in the shower or the kitchen while preparing your meal. You can use it to listen to music or even your local news before you head to work in the morning. 10 FM preset radio stations and storage. Red LED display is gentle on eyes at night. AC powered but accepts two AAA batteries for radio, alarm and time display functions in case of power outages. Independent 30-inch antenna for excellent radio reception. 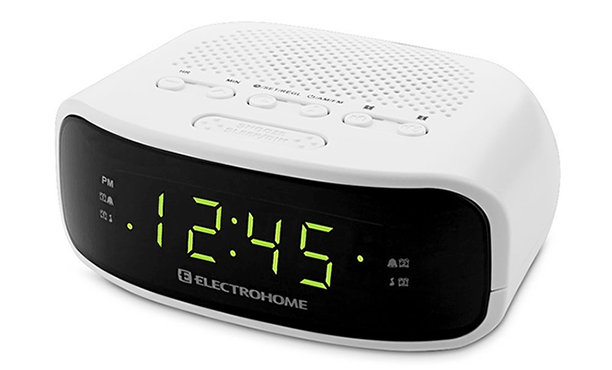 The Electrohome EAAC201 is one of the modern looking clock radios with its large and easy-to-read six-inch LED display screen. Unlike traditional clock radios, it does not use a 9V or coin type batteries for power. Instead, it uses AA batteries for backup power. It is easy to operate, and you can easily carry it around while unplugged. 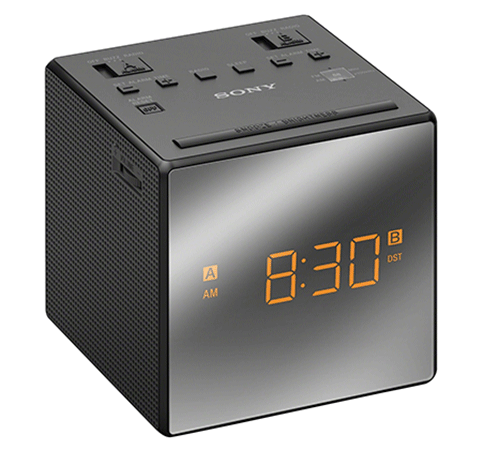 This Sony ICFC1T is for people who like being soothed awake, not woken up gung-ho style or military style. Perhaps its nicest feature is the progressive alarm that gradually gets louder to wake you up softly. What’s more, setup is easy, and the orange LED display is adequately bright at night while at the same time will not harm your eyes. 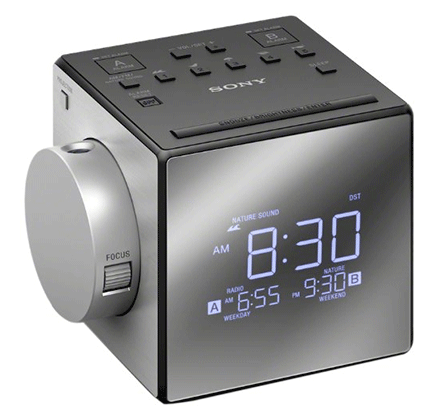 This clock does everything you need it to and features everything you could ever need in a clock radio. 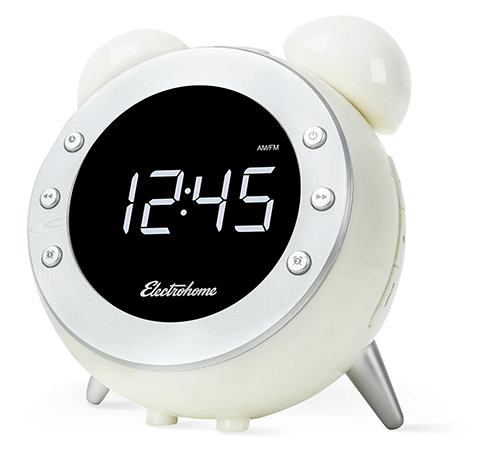 I would go as far as saying the Electrohome EAAC470 a smart clock radio that is perfect for techies. The Emerson CKS1708 is very nice right from its packaging. Setting up was a walk in the park largely thanks to its automatic date and time setting mechanism. Overall, it has a respectable volume level that is adequate as a buzzer or for listening to music. Buyers of the Sony ICFC1PJ will be pleased with the nature sounds and the easy to read LED display of the two alarm settings. Its speakers are mounted at the back, and a cool feature is that the display allows you to remove the time display if you don’t need it. Its small built means it is portable and great for traveling. 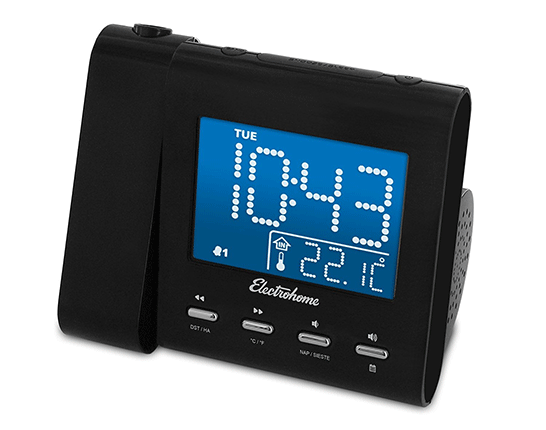 This clock radio is for people that want a simple alarm clock that is compact and comes in various colors. When you press the reset button to stop the alarm, it automatically sets it for the next morning so that you don’t have to keep resetting it. For this reason, the ICFC1 is ideal for everyone. The Electrohome EAAC475 feels sturdily built and comes with a bunch of features that you will probably not use. Two of the features you will love most are the auto date and time set and the second is the ability to turn off the display completely. You won’t have to struggle with setting the date every time there is a power outage and turning the display off means; you can sleep soundly without having to deal with light interruptions. Runners up on our list is the EAAC601. Most people are sold when they see its projection capabilities. Unlike other models which show blurred projections, this clock does a great job in projecting clear time and temperature levels. It also features soothing music that can put you to sleep or wake you in the morning. Advanced SelfSet technology to automatically set the correct date and time with an automatically adjustable DST. 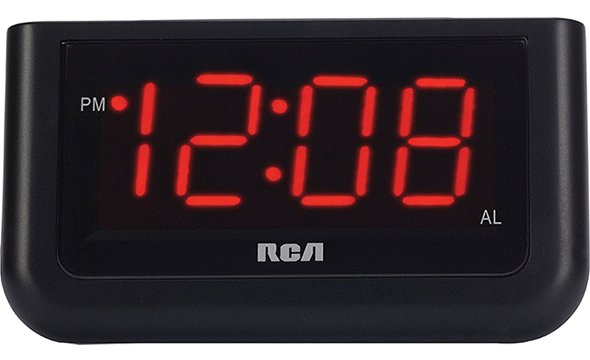 The best-rated radio clock and first on our list is the RCA. 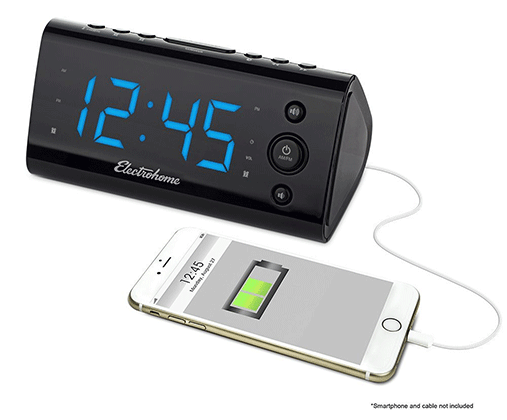 If you’re picky about your alarm clocks, you will be impressed with this device. It passed our brightness, number size and sound test with flying colors. Also, it has a sturdy build for durability and the materials feel high quality to offer reliability. Ease of use: How complicated is it to use? Reliability: Can you rely on it to wake you each morning?